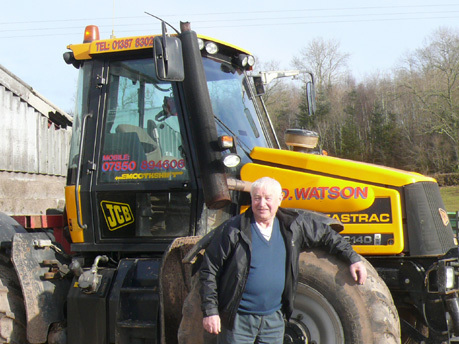 Over fifty years ago, dairy farmer, Drew Watson of Byeloch Farm, Mouswald, Dumfriesshire set out contracting locally, with a Massey 35. He progressed to a 135 then a 165. “We had the Masseys for a long time – they did us well. About thirty years ago we changed our main tractors to New Holland and have been using them ever since,” explained Drew, who also runs some John Deere tractors and JCBs. From the early days with basic machinery, Drew has had to keep abreast of modern technology and can offer farmers GPS mapped fertiliser spreading. So far only 1500acres of the land that he spreads is GPS mapped, but he feels that other farmers will soon catch on as the mapping is relatively cheap and it offers a saving on fertilizer. A new Amazone spreader is used for that job. 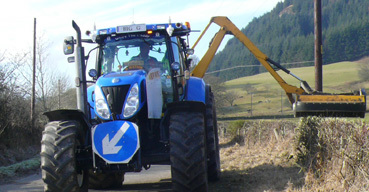 Modern techniques also come into play with slurry application where Drew can offer slurry application with either traditional splashplate, or with a shallow disc all track injector or with a trailing shoe. All techniques have a flow meter to monitor application rates and Drew has his own nitrogen testing kit. The Watsons employ nine men full time and take on casual workers from spring time until end of maize harvest. Most of the casual staff come with their own tractors, but Drew is finding it increasingly harder to find good part time and full time staff. During my visit the phone was constantly ringing and Drew and his wife Jeannie dealt with various requests professionally – and it was a quiet time of year! The busy spell starts with Spring work when plastic maize, grain and all other seeds are drilled, overlapping with first cut silage, a lot of slurry applied, then baling, whole crop, second cut silage and straight into harvest, followed by a big rush on umbilical slurry spreading after the closed period. “Farmers are trying to utilise their slurry more, seeing it as a useful product rather waste – in doing so they are cutting their fertilizer bit a bit. Dairy farmers are cottoning on to injecting their slurry as cows can graze it very shortly after,” said Drew who uses a Nutritech machine for slurry injecting. Harvesting of maize and fodder beet keeps staff busy from the end of October. “We have seen a big uptake of plastic covered maize in this area, as it more or less is an insurance that the maize can be harvested 3 weeks earlier. We have two Kemper headers and two plastic laying drills which plants the maize, applies chemical and lays the plastic in one pass,” explained Drew. Spraying and combining are Drew’s forte, while his son John (27) is heavily involved in the contracting side, Drew milks the 80 head of Holstein Friesian cows every morning before attending to anything else.